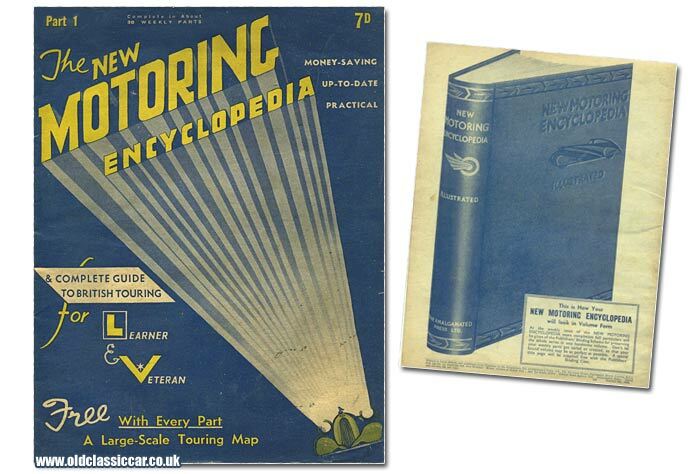 The New Motoring Encyclopedia of 1936 and 1937. Homepage. This page: A look at a set of motoring magazines issued in weekly parts in 1936/1937. The New Motoring Encyclopedia & Complete Guide to British Touring. Many magazines in the 1930's, such as The Autocar and The Light Car, looked at motoring news and included roadtests of the latest cars to hit the market. Others, such as Modern Motor Repair, focused on the maintenance of the motor-car by the private motorist. The New Motoring Encyclopedia & Complete Guide to British Touring, to give it its full title, aimed to build up a handy reference work for anyone interested in motoring facts, figures, and in addition, brief introductions to towns and villages across the UK. Issue number 1 was issued on 8th October 1936, with the final issue, number 35, rounding out the set on June 3rd 1937. All but the final part also included a free large-scale touring map. The cover illustration features a car with its headlights blazing skywards, illuminating the magazine's title in the art deco style. The inside cover of each copy featured an introduction to that week's subject matter, along with various motoring observations from the "Editor's Note Book". The very first article in issue 1 is a supplement penned by a Major Oliver Stewart, headed "Learners' Lore". This was "... a compendium of driving experience which, with the greatest possible economy of words, covers the whole art and practice of handling the modern motor-car". In the driving seat do not slouch and slop. I do not say this simply because it may happen to "look" better to see a driver sitting up properly at the wheel, but because the standard of his driving is affected by his position in steering the car, and sometimes very markedly affected. Adjust the driving seat ao that the wheel comes comfortably to hand when the body is held erect. Sit up and keep the head up. One of the essentials of good driving, though few seem to realise it, is to keep the head erect and, so long as the car is moving at anything more than about ten miles an hour, turned straight to the front. When coming to a standstill beside the curb ensure that the car gets really close to the curb, though without the tyres actually touching. The radiator emblem or mascot can be used as an angular guide for telling you how far from the curb you are; but remember when using this guide that the accuracy of the reading also depends upon your own position. With the driving tips supplement successfully negotiated, the motoring encyclopedia could get going. The very first entry, perhaps unsurprisingly, is for the A.A. (Automobile Association), followed by brief notes on Abbey Dore (a parish in Monmouthshire) and then Abbotsbury, near Weymouth. In fact a number of towns are described before the next proper motoring reference comes along, this for the A.C. Acedes sportscar, which is both described and illustrated, thanks to a contemporary press photograph of just such a 16hp AC (registration CPL 572). Studious readers that week would also learn about subjects as diverse as "Advance and Retard", four cylinder AJS motor-cars, Alvis cars (including the Firebird, Speed Twenty-Five, Crested Eagle, and the 4.3 Litre), with the final entry for Week 1 being a look at "Austin Cars and Their Running". With Austins being extremely popular in the 1930's, two-and-a-half pages look into the current model range in reasonable detail. Factory illustrations remind the reader of the 12hp New Ascot, and the 7hp New Ruby, while those needing a larger car would have probably flicked over the page and found the ghosted view of an Austin 14hp Goodwood saloon to be of most interest. Completing the look at Longbridge's finest is a brief mention of the six-cylinder Austin Eighteen, ".. a particularly attractive model that has undergone gradual development over a period of years". Issues 1 through to 22 suggest that the Motoring Encyclopedia would be complete in about 30 weekly parts. By week 23 this estimate on the cover had been revised to 34 parts, and in week 28 this had increased again, to an estimated 35 weekly parts, which proved to be the case. Issue 35 of the New Motoring Encyclopedia. June 3rd 1937 saw the final issue hit the newstands, and is split into two halves. The first completes the alphabetical stroll through the motoring subjects, ending with a French motor-car called the Zedel, and a note about a village called Zennor in Cornwall. The Zedel voiture first went on sale in 1907 we're told, and became a popular choice on the Continent, with a few making it to these shores. The final model, which soldiered on until production of the Zedel ended in 1928, was a four cylinder 13.9hp (RAC) sidevalve, of 2121cc. This page, numbered 828, completed the main body of the Encyclopedia. There then follows a supplement, which adds in some information on cars and developments that had been introduced during the publication of the main work. Cars new for 1937 included a streamlined Adler from Germany, and a new addition to the Alta range of sports/racing machines. In fact streamlining was all the rage, with wind-cheating cars from Cord, Ford with their V8, Hansa-Lloyd (with a four-piece windscreen! ), Hudson, Opel's new Admiral, and Pontiac's Silver Streak all being mentioned. The new British cars, such as those from Alvis, Ford, Singer and Squire, eschewed these modern aerodynamic trends and fripperies, and stuck with a more traditional "look". This is a high-performance British car fitted with a Ford V-8 engine. This power unit is rated at 30hp and has a piston displacement of 3621.5cc. The bore and stroke dimensions are 77.78mm x 95.25mm. A number of modifications are carried out on the engine; high compression cylinder heads are fitted and instead of the usual coil-and-battery a Scintilla Vertex magneto is used. A further alteration is that the standard camshaft is replaced by a special type and there are two carburetters. The fuel is fed to these by means of two electric pumps. In the frame design substantial modifications are carried out also. The side members are of deep section and copiously braced. Just behind the rear engine mounting the side girders are dropped and they are underslung at the axle. The suspension system consists of half-elliptic springs in front and reversed quarter-elliptic springs at the rear; Hartford friction type triple shock absorbers are fitted all round. In the transmission arrangement a Ford clutch and gear-box are employed, but alterations are made to the final drive. The propeller shaft is of the open type and fitted with a torque stay and the rear axle is modified to give higher overall ratios. Another feature of the Leidart is the high geared steering. The car is very low built and has good road holding qualities and - owing to its power-to-weight ratio - a very fine performance. There is a special speed model, fitted with two superchargers and it has a guaranteed speed of 125 mph. Bodies are to individual requirements and a two-seater, a four-seater and a sports saloon are included in those types available. The wheelbase of the two-seater is 8ft 5ins and the total weight is only 19cwt 2qrs. As a set, the New Motoring Encyclopedia is a very handy reference for anyone interested in pre-war motoring. Nowadays, there are many more books, magazines and online resources to answer questions relating to the automobile, but in the 1930's publications such as this were invaluable. Unless you collected and indexed all the other motoring magazines (The Autocar etc), how else would you be able to quickly read-up on, and see photos of, cars such as the Lammas Graham, the streamlined Steyr from Austria, the air-cooled and wood/steel-chassis Franklin, or the collapsible Rice three-man caravan?